Ideally, you have to baseline the project after you�ve completely satisfied with your estimations and schedules of the project. By saving a baseline, you�re basically creating the snapshot of initial schedules, tasks, resources and cost information in your project plan at that point of time, that is, before you enter first actual work and percent complete of the work. It means, at this time percent complete of work is 0% actual work is 0 hours. 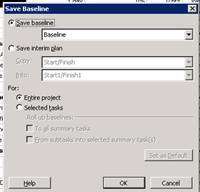 You can save up to 11 baselines in a single project plan. Te baselines are named Baseline, baseline 1 through Baseline 10. Please note that Baseline is the first baseline you would normally save. Each of your save action on baseline activity will be associated with date. This makes it easy to find out if a baseline has already has been used and when it was last saved. 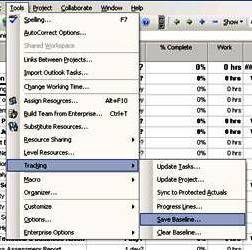 When you save a baseline, Microsoft Project application copies the task, resource, assignment, and cost information in schedule fields to baseline fields.